Warm effort: Multicultural Development Australia Toowoomba has run a “Toowoomba Coast Rack” campaign to help migrants and refugees in the area to stay warm during winter. CATHOLIC agencies and ministries in Toowoomba have joined a campaign to help migrants and refugees in the area keep warm during winter. Catholic Care Social Services, Toowoomba Refugee and Migrant Support and Mercy Community Services partnered with Multicultural Development Australia (MDA Ltd) Toowoomba for the “Toowoomba Coat Rack” campaign. Winter can be a tough season for many people who are unable to sufficiently heat their home or may not have enough clothing to cope with the cold. 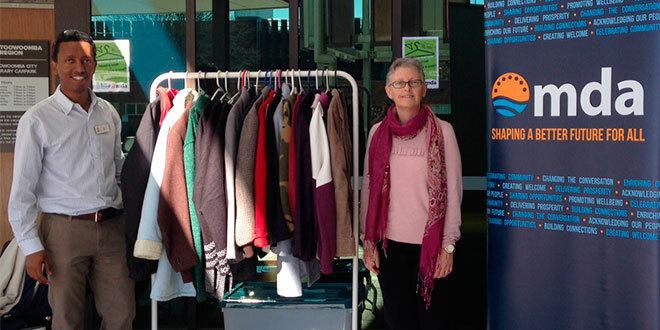 From July 10 to 21, community members could give or receive a coat from the Toowoomba Regional Library from 10am-2pm daily. MDA regional manager for the South West Region Kelly Buckingham said she saw a similar idea during a trip to Canberra. “Canberrans know a thing or two about cold and I just thought it was such a wonderful opportunity for the community to come together and help each other,” Ms Buckingham said. “Toowoomba is an incredibly giving community and I hope we can make winter a better time for a few people. “Someone might be able to donate an unwanted coat, but some may be able to donate their time to assist with collection and distribution which is just as helpful. MDA South West Region assists newly arrived migrants and refugees with settlement into their new community. Its work is based on helping new arrivals overcome the everyday challenges of settling into a new country and working with them to build their futures. For more details contact Fikre Desta at MDA on (07) 4632 1466.